The invention of incandescent light bulb by Thomas Alva Edison and his team, was one of the greatest invention in the history. After continuous research on the bulbs, scientist have discovered that LED and CFL bulbs are far better than the incandescent ones. When it comes to making choice in bulbs, LED bulbs are much more efficient than CFL bulbs in terms of power consumption and life years, but at the same time, their cost is high. One have to make a choice between these two as they are found in a wide variety in the market which is available as per the requirement and demand. This article will give you a thorough understanding on the difference between LED and CFL bulbs. LED bulbs also referred to as “Light Emitting Diode” light bulb, is the most energy efficient lighting devices invented till now. These bulbs consume very less energy as compared to other light sources. These energy efficient devices are becoming very popular in different areas, including aviation, traffic signals, mining industry, lifts and much more. It does not contain mercury like CFL bulbs do, but contains other harmful components like lead and nickel. The most notable feature of LED bulbs is that they can be recycled. You may wonder, how do they work? Well, The electrons are passed through the semiconductor material which illuminates the tiny particles, known as LEDs. 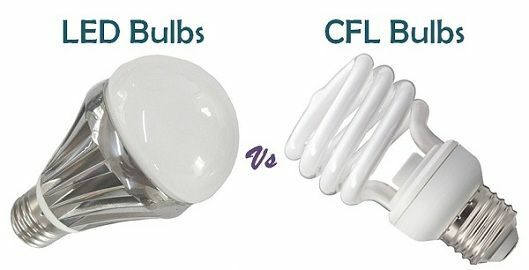 CFL bulbs also referred to as “Compact Fluorescent light” bulbs light bulbs are more energy efficient bulbs as compared to the incandescent bulbs, but less efficient than LED. These bulbs are made up of Argon and the small amount of mercury. They are used in offices, stores, homes, and schools, etc. for the lighting purposes. Normally, they are available in spiral or helical shape, and they take the time to lighten up completely. The LED bulb stands for Light Emitting Diode, and CFL stands for Compact Fluorescent Light. LED bulbs are more energy efficient than CFLs. The LED bulb consumes less electricity than its counterpart CFL 75% a year in energy cost. The life of a LED bulb is usually up to 50000 hours or more while the life of a CFL bulb is up to 8000 hours. The LED bulb is expensive than a CFL bulb. The primary difference between them is LED bulbs are durable and long lasting as compared to the CFLs. The size of LED bulb is usually smaller than a CFL bulb. The LED bulb, when lighten up remains cool, whereas the CFL bulb gets heated up quickly. Priced higher than a traditional incandescent bulb. The decision is tough for a person to choose between the two: LED and CFL. Both are good in place, but there are many differences between them which we have already discussed. These differences may help you to choose among them according to your requirement and the ability to pay. LED bulbs are no doubt way ahead of Compact Fluorescent light bulbs. Nowadays, the cost of LED bulbs are decreasing gradually, and in the coming time, you may expect a LED bulb costing less than a CFL bulb. You have written very clearly on difference between LED and CFL bulbs. Your point to point writing helps me to understand the whole article clearly. Surbhi S, thanks for sharing this informative post.